Willow Rock Has Officially Expanded! Our new brewhouse is in place and operating. New beers and old favorites coming on draft all the time! Willow Rock Brewing Company is teaming up with thousands of breweries across America to help battle the devastating effects of the most recent California wildfire. Brewing Resilience IPA in conjunction with Sierra Nevada Brewing, Willow Rock will be donating every cent of sales directly to a fundraiser for the victims in Butte and surrounding counties of the Camp fire. A traditional west coast IPA, expect a release in early January. Everyone wants to help, it’s easy to have a pint. Congress is back in cans! Local news station WSYR covers the new release of Willow Rock’s Congress in cans. Available at Willow Rock Brewing Company and an expanding list of select retailers around Syracuse. Congress is Back in Session! 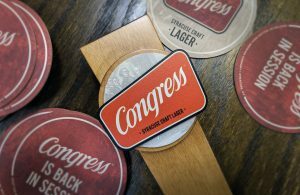 Congress, the most celebrated beer in Syracuse history, is back! The team at Willow Rock spent eight months perfecting a beer that respects the Congress legacy and satisfies the tastes of today’s beer drinkers. Congress offers the present-day appeal of an everyday beer, delivering an approachable craft beer experience that features a good, crisp taste that is not too bitter and is easy to drink. Willow Rock Brewing Company and the Onondaga Historical Association release an updated version of the historic Congress Beer Lager at a special ceremony at the Syracuse Marriott Downtown. Congress Beer will hit taps at the brewery; outside food truck Bold Coast Lobster Co.
Limited Congress apparel and collectibles will also be for sale.